Today, we’re celebrating yet another holiday from the mind of my favorite dinosaur about any three things you love. Since I just did a Hate post yesterday, it seems only fair and balanced to do a love post today. Coming up with three things I love was surprisingly difficult since the #1 thing I love died in March. I had to really think about three things that make my current state of depression and grief more bearable. So, without further ado, I present three things I love with reckless abandon. I was going to just say “my dog,” but I didn’t want to leave my relatively useless loaf of cat out. He doesn’t do much besides change places to lounge once in a while, however, he is excellent at receiving affection and his purrs are quite therapeutic. So, I thought about putting “my animals” as the header. Then, I remembered the best hour of my day is going to the dog park where I get to pet a million different dogs. I always feel like Snow White in the forest. Hello, my friends. How are you today? Animals have a sixth sense for knowing when you’re unhappy or down. They will do whatever they can to cheer you up. They are loyal and constant and give absolutely unconditional love. Yes, even my cat unconditionally loves me. He might get annoyed when I take him to the vet, but he always comes around. I couldn’t survive this world without a fuzzy critter around to try to make everything better and I certainly wouldn’t try. My personal slice of joy and frustration. My sense of humor has become tarnished and dull lately, partly due to grief and partly from depression, but it is ultimately responsible for my continued existence. Without it, I would not have survived this long. I would have caved under the weight of trauma long ago. My humor allows me to find the levity in everything, and believe me, there is something funny about everything that has ever happened. You might not find it at the time, but perhaps years later, you will find something bright and shiny buried under even the deepest tragedies. There is always a little silver string of humor in everything, even if it’s only tangentially related. My sense of humor hasn’t been good at finding the silver string lately. 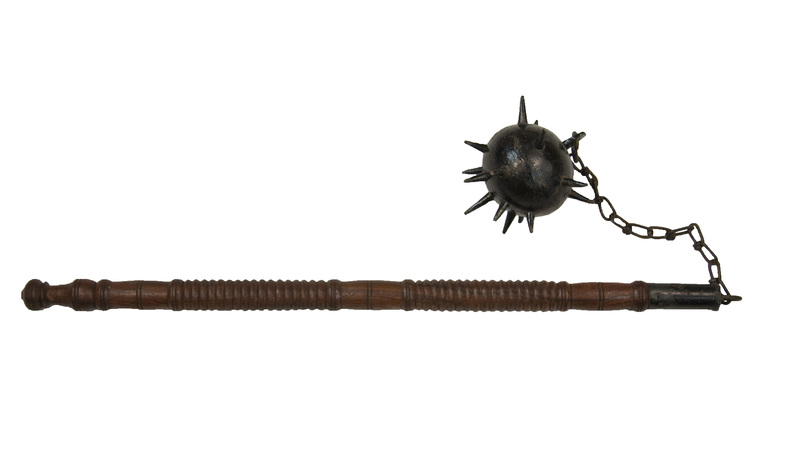 It has morphed from a lightweight samurai sword to more of a medieval weapon like a morning star. It is cumbersome and unwieldy. It is almost too heavy to lift, let alone use effectively, and sometimes, I hurt myself with it, but it is not gone. It’s not a razor-sharp weapon now, but it can still deliver a blunt force blow. It has not disappeared entirely and thanks be for that, since if it had, I wouldn’t be here. I’ve been having trouble with those lately, too. They don’t come easily. They don’t flow. I edit like crazy and I still can’t get them in the proper formation; I can only get them good enough. They don’t form in my brain and pester me until I write them down like they normally do; I have to force them out. I have to pull and prod and cajole them into existence. But, even if I can’t find my own words, you always have yours. No matter what I write, there you are with your own experiences, insight and humor. You help. Once I hit publish on this choppy, half-assed post, which is a mere fraction of what I’m capable, I know you will be there with your own words that will mingle with mine to form a whole. Thanks for that. Happy Tribus. Also in the running for three things: coffee and music. What’s your Tribus? Show us your three and link up. Posted in misc. business and tagged #HappyTribus, Happy Tribus, love, three things. Bookmark the permalink. 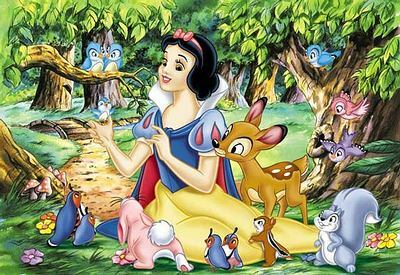 Well, Snow White with certain animals. If a possum comes into the forest, I’m outta there. I had a dream last night that you adopted a possum and named it Zeplin, for some reason. Animals definitely know when we need extra love, but they also know who loves them the most. I don’t trust anyone who says they “hate” any specific animal that they’ve never been around. We all go through phases and stages during our grief process. I can tell you that at times, it seemingly takes years. I openly admit that some are harder than others, but I want you to know that you NEVER forget. There is always a piece of the other person that resides within your soul. It’s harder on some days than others. Lately, it’s hard every day. It, too, shall pass. I’m perfectly okay if people prefer animals over people. In fact, I think that’s a good idea for many of us, but anyone who says they “hate” an animal pisses me off. I’ve lived and continue to live the grief you are experiencing. It comes in waves, and sometimes it slams into you and doesn’t leave for long periods of time. What disturbs me the most is that the world keeps on moving while we suffer, as if nothing has happened and for some unknown reason, many people expect you to be “over it” quickly. I don’t have a positive response mechanism for that. Thanks, SG. I’m sorry that anyone knows what this is like. I don’t have a positive response mechanism for that either. Some good things going out in the blogging world today. Not from me…but from you and Rara and others. Me…I’m dull. Indeed. You’re never dull, Jackie. Never ever. If you feel trouble with flow just remember this advice. It’s okay to be wrong. That usually helps me. Happy Tribus Day! Very true. The words don’t have to be right; they just have to be there. Happy Tribus. I Love your blog and admire the courage you evidence in your writing. For those who survive hell with humor, laughter becomes a lot like breathing. Not so very long ago I learned that, ”Deep grief” unlike other forms of hell throws a pall over this ability. To those that find life in laughter this is fairly frightening. Fear not. Like the tide it may be at low ebb but it will never leave you. As you heal, the flow will return and it will become a part of your healing. It’s an annoying byproduct of the human experience that we oft feel compelled to offer useless advice. Here’s my rapidly depreciating two cents worth. When I began to lose my flow awhile back, I decided to adapt Douglas Adam’s technique of flight, but instead of the ground, tried to throw myself at seriousness and miss. Seems to work. Good luck upon your path and Blessed Be. I completely forgot about this today, so I will say you, Rara and CoachDaddy are the three things I love today. Here’s something else to add to your happy thoughts. I’ve nominated you for the Starlight Blogger Award. http://wp.me/p1fG2n-l4S I hope you accept. Thanks. I missed you, too.